The story of how music became my life starts many years ago in Bogota - Colombia where I was born. I come from a very musical family (my grandfather used to play tiple, my dad plays guitar, my mum sings beautifully...) but I am the first one to give it -music- a go as a career and I'm very happy with that decision. I started playing the guitar at the age of 10, I've been playing it for 24 years (you do the maths!) and I'm planning to keep on going. After 11 years of self teaching and after completing a degree in Mathematics at the F.J.C. 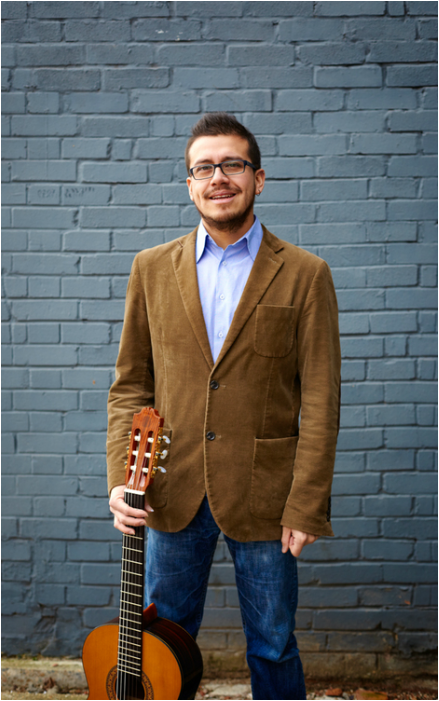 University in Bogota, I started professional studies in Music and Classical Guitar and Music Theory at the "Centre for Music Studies CRISTANCHO" today the Music Department of Sergio Arboleda's University. Apart from Guitar I play several other instruments from South America such as Tiple, Cuatro and Charango, and also a little bit of Quena (flute). When I moved to London I continued with my music studies including Acappella Jazz singing at the City Lit College, a Music Access course at Morley College where I joined the Chamber Choir under the direction of Rober Hanson and Gospel Choir as well. To enrich my musical knowledge I went to the LCCM "London Centre of Contemporary Music" where I completed a Degree in Music Performance and Production with emphasis on MDA (Music Director and Arranger) received from Middlesex University. Along with the passion for acoustic music, I'm a big fan of choral music, vocal projects and a cappella ensembles, passion that I've been exploring by taking courses with some of my favourite singers and choir directors such as Stephen Connolly (former member of The King's Singers) "International Acappella School 2009/2010", Eric Whitacre (2012) and The King's Singers (Summer School 2015). In 2012 I started the "London Colombian Choir" a great community project with 60 enthusiastic people singing Colombian Christmas Carols under my direction, with the support of the Colombian Consulate. In 2014/15 I had the pleasure to work as an MD of a London based a cappella ensemble "Mixtape Manifesto" writing some of their arrangements and co-directing it. Currently I lead the "LOLCHOIR" (LOL = Landscapes Of Latin America), a choir I started in 2013 specialised in folk repertoire from Spanish speaking countries. The 'choir director hat' has also brought me to work with the Mary Ward Centre College ("Love to sing" teacher) since 2015, the SOAS University World Music Choir (choir leader since January 2016), and also leading the community choir "Stapleton Singers" in North London (since 2015). For the last few years I've been committed to performing with a variety of bands that range from Afro-Colombian & Afro-Peruvian music to Andean Jazz, Sudanese Fusion Music and English pop/folk. In 2009 I met English composer Magnus Fiennes, who got me to record some of his music (guitar and charango) for TV Series "The Fixer" on ITV seasons 1 and 2, as well as music for a Scottish film "Donkeys" in 2010 and other of his projects. Hard work pays off! In 2011 I won a competition in the GSD Music Awards 2011 as the "Best Newcomer" for the Latin American network in the UK. Recently and thanks to the support of my family, friends and fans I won two prizes in the "Latin UK Awards 2012-13" -LUKAS- for "Musician of the year 2012-13" and "Community worker of the year 2012-13" for the London Colombian Choir. In the next version of the LUKAS Awards I had the fortune of being selected for second consecutive year "Musician of the year 2013-14" as a recognition of the musical and educational projects (involving music) that I'm part of. In the 2015 version of the Latin UK Awards and thanks to the support of followers and friends we got the runner up place in three different categories with the theatre play 'Manuelita' (theatre production of the year), 'CUMBE' (folkloric act) & musician of the year. I've been invited to play with different bands and also as a solo act and Latin American singing leader/facilitator to several festivals in the UK such as Sunrise Festival 2013, Latitude Festival 2012, Carnaval del Pueblo 2009/10, Tribe of Doris Festival 2007/08/10, Shambala Festival 2012, Hanscamp 2010 amongst others. In January 2012 I made my first Africa gig :D when I got an invitation to the "Festival au Desert" in Timbuktu -Mali- accompanying Sudanese singer songwriter Amira Kheir. With Amira we also did a Holland tour at the beginning of 2013. After the Holland tour at the beginning of the year, I got an invitation to be part of a big project called “The Magic Flute” as part of Rudolstadt Festival in Germany on the first week of July 2013. With the Magic Flute project, with another 13 musicians from India, Turkey, Germany, Ireland, France, Niger, Japan Colombia and Denmark we prepared two concerts to be performed at the Rodulstadt Castle and Rudolstadt Church with a great response from the audience. Within the same festival I performed with the Mauricio Velasierra Quintet playing Andean Jazz fusioning Latin American Traditional rhtythms with modern harmonies and melodies. Sweden and Turkey have been also part of the 2013 trips, places that received me and my Colombian music band “CUMBE” in July and September respectively. 2014 was a year of exploring two new scenarios, 'Music for theatre' and development of 'Educational projects' involving music. Early in the year I joined "POPELEI" -Theatre Company- for the creation of the music for a play "MANUELITA". After a very successful start in London, we brought the play to The Fringe Festival 2014 in Edinburgh and performed for the whole month gaining recognition and great feedback that allowed us to get excellent reviews and also to win the "THREE WEEKS AWARD" for our contribution to the festival by bringing an uplifting and refined piece of Theatre & Music. On the educational side of things there have been two main experiences, one at WOMAD Festival 2014 where I was part of a great project involving students from the Malmesbury area to prepare and perform a concert to officially open the festival with the AMJ Collective, a group of musicians from different nationalities playing reggae fusion with Latin American grooves. With the AMJ collective we keep on working in educational projects in the Bath/Bristol area mainly. 2015 & 2016 has also opened a door with the French Lycée in London, giving musical direction to a group of students (singers and instrumentalists) that will perform some Latin American and Spanish folk songs in a theatrical adaptation of a Shakespeare play to be performed in the summer. Some other spaces where I've been using my musical skills are "Finding Rhythms", "SUPERACT" and "Pasaporte Cultural", all British organisations that use music to cause a good impact in society. I'll keep updating this space so all the exciting projects, concerts and musical things I get involved in shall be shared and enjoyed by as many people as possible. Thanks for visiting my website and do not hesitate to get in touch!